The optimism of youth gets scrambled with the affairs of adults in ‘Mud’, the latest film from writer/director, Jeff Nichols (‘Take Shelter’). It’s a stripped back approach to tracking the process of growing up, but lacks the faith to see the plan executed to the end. Two 14 year-old boys (Tye Sheridan and Jacob Lofland) who are living in the swampland of Arkansas, U.S.A, help an armed stranger named Mud (Matthew McConaughey) who is hiding on an island on the Mississippi River. The path of the young characters is authentic thanks to fantastic performances from Sheridan and Lofland. ‘Mud’ has more depth than the usual “coming of age” flick and isn’t bound by the halls of a high school, sexual pursuits or the all-important prom. There is genuine pain in the growth of the teenage leads as they involve themselves in the complicated relationships of the adult characters. The male role model hierarchy built within the film is excellent and flows from fathers to uncles, neighbours and Mud. It’s interesting watching the boys place their trust in each male character and the consequences of their interactions. The “McConaissance” continues (see: ‘The Lincoln Lawyer’, ‘Magic Mike’, ‘Killer Joe’, ‘Bernie’ and ‘The Papeboy’) with McConaughey in superb form as the charming but untrustworthy drifter. Playing Mud’s trashy and problematic girlfriend is Reese Witherspoon, who is fragile, beautiful and dangerous. The role of a wise but goofy uncle is inhabited by Michael Shannon who is incredible in an almost minuscule role. The cinematography from Adam Stone adds a little romance to the swampy decor and perfectly captures the transient nature of the river and the life that runs through it. Nichols does take his time telling the story, and ‘Mud’ has a reflective mood which does make the plot a little tedious at times. Towards the finale, in pursuit of a jubilant Hollywood ending Nichols’ almost completely washes away all his hard work and betrays the honesty of the film. 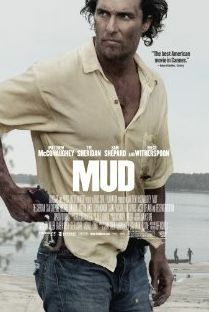 Mud is a loose amalgamation of ‘Stand By Me’ and ‘The Adventures of Huckleberry Finn’ (but minus all the slavery).